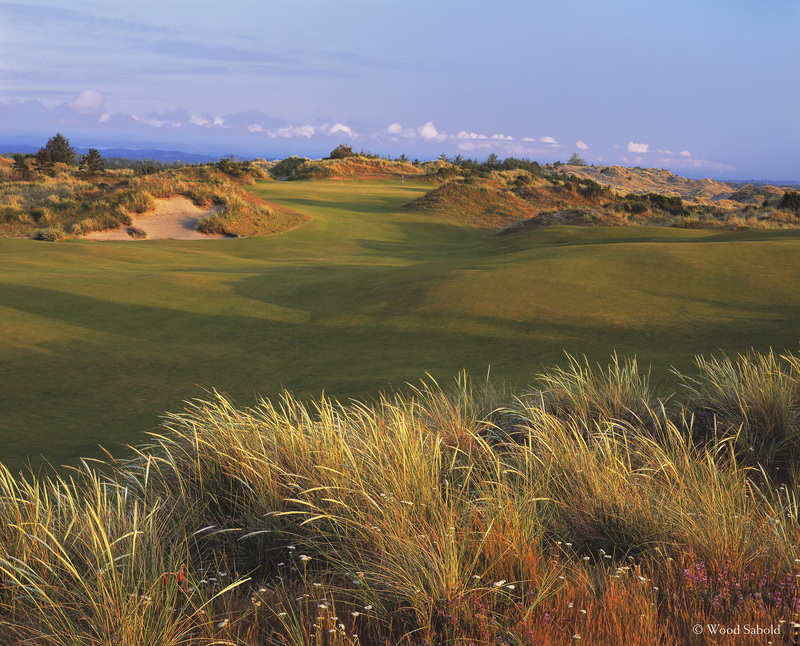 A view looking up the fairway with a foreground of varied dune vegetation to the elevated green of the Par 4, 1st hole of the Bandon Trails Course of the Bandon Dunes Golf Resort, Bandon, Oregon. This hole is the first that is played in the dunes. The dune vegetation in the foreground is only in play with a very short or far right tee shot. It is one of the resort’s great first holes with its inviting play from the fairway but intimidating view from the tee area. The fairway is an inviting bowl that can put accurately placed tee shots in a nice uphill valley position with a framed view of the green. However, going left is a shot that ends up in the beach grass or in one of a series of bunkers some blind from the tee.